“AFTER THIS [Paul] departed from Athens and went to Corinth. an edict that all Jews were to leave Rome. And [Paul] went to see them. The point of the subject in this blog is not to dispute what kind of TENTS the apostle Paul, Aquila and Priscilla made or didn’t make. My only intent was to uncover the possibilities that were presented through Scripture and Jewish historical records. It is about the “What if” factors only. The readers will have to come to their own conclusions. Does deciding what kind of tents the apostle Paul really crafted important? Was the “tent” making really “tents” or could they have been “prayer shawls”? My points in the “this” or “that” of Paul’s part-time job, is only a symbolic picture of something that God is doing on earth. As Christians, we have a Jewish heritage through our Lord and Saviour, Jesus Christ. Familiarity with the heritage benefits us in our understanding of God’s Word and the significance Jewish customs. “Adah bore Jabal: he was the father of those who dwell in tents and have cattle and purchase possessions” (Genesis 4:20). Following the flood God enlarged Japheth (son of Noah); “and let him dwell in the tents of Shem” (Genesis 9:27). In the above image [“This” of Tent Making), you can see Bedouin Arabs living a nomadic lifestyle in tent’s that haven’t changed in construction since Ancient Biblical times (Bedouins were makers of tents themselves). The tents were made from goats’ hair or dark sheep’s wool woven in rectangular strips on large looms. The women wove the fabric for the tents, then stitched them together and kept them in good repair. They also made the ropes that tethered the tent to the ground. In effect, they were the tradespeople who produced their own housing and did not need or rely on imported tents. Historians have the apostle Paul arriving in Corinth around 49 or 50 C.E. Rome had destroyed the city in 146 B.C.E. so when Paul arrived he saw a young rebuilding city–not even a century old. In 44 B.C.E., Julius Caesar gave a decree that refounded Corinth; a new Roman colony. Corinth was the capital of the province of Achaia. It was a city that was socially, culturally, and diverse in religion including the Jews. The Jews who were living there; were more cosmopolitan and more multicultural than those living in Palestine. Archeological digs and excavations of the ancient city tell us that the Corinthian Christians lived in large complexed households and worshiped in-house churches because of religious persecutions; Jews worshiped in the local synagogues. 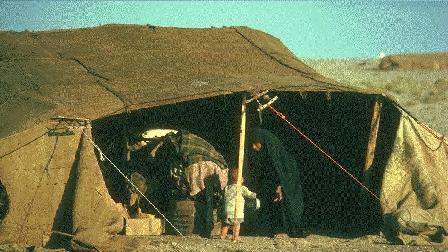 The people who lived in Corinth did not live in Bedouin tents and were not nomadic in any way. They live in houses as did the people who resided in Jerusalem. WAS PAUL REALLY A “TENT” MAKER? “I [Paul] am a Jew, from Tarsus in Cilicia, a citizen of no insignificant or undistinguished city” (Acts 21:39; Acts 22:3). “Circumcised when I was eight days old, of the race of Israel, of the tribe of Benjamin, a Hebrew [and the son] of Hebrews; as to the observance of the Law I was of [the party of] the Pharisees” (Philippians 3:5–Amplified bible). At about the age of six (Josephus’ historical account), Paul attended the synagogue school for instructions in the Scriptures and Hebrew. His further education was in Jerusalem under Gamaliel (Acts 22:3). Why am I informing you to Paul’s up-bringing? It is to let you try to understand that Paul did not have time to learn a trade as a tentmaker. Jesus had learned the trade of being a carpenter by his early apprenticeship with his father Joseph. Paul had fully absorbed all the knowledge of the LAW, the customs, the manners as he grew into manhood. Thus, he would have legitimate expertise and knowledge of making the very special item; the makings of the “TALLITH”; a specifically gifted talent. Thus, you have “Little Tent” and each man had his own tallith. Numbers (B’Midvar) 15:37-41 and Deuteronomy 22:12 in the TANAKH, TORAH gives a detailed description of the “little tent“, given to Moses by the Lord. Jewish men (women if they wanted) used the TALLITH (prayer shawl) to wrap themselves during their daily prayers and devotions and was known as their “tent of prayer“. The men wore the TALITH, TALIS, TALIT not just in prayer but all the time as Paul did, the Apostles, and Jesus who obeyed the custom recorded in Scripture (Luke 8:43-48). God doesn’t do away with a lot of things that we have done away with over time. God isn’t offended by the Jewish culture. Based on that number, it obvious that 6 million people couldn’t fit into the tent of meeting set up in the Old Testament. Therefore, what was given to them was their own private sanctuary or tabernacle; where they could meet with God. Each man had one! 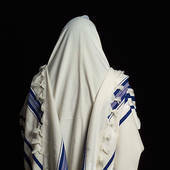 His prayer shawl or Talis. They would pull it up over their head, forming a tent. There they could chant, sing Hebrew songs, and call upon Elohim, Yahweh, Adonai. It was intimate, private and set apart from anyone else, enabling them to totally focus upon God. It was their “prayer closet” (Matt. 6:6). [or was it “that” image]. My wife and I try to arrive at church on Sundays, before worship and praise begins, to focus upon God. We are not always successful in our attempts, because of the pre-service fellowship. God does know the hearts of men and women so a “prayer shawl” is not needed for intimate fellowship. The “prayer shawl” had fringe in each of its’ four corners artistically made. Each strand wrapping and knots of the cords had a purpose. The fringe was made with eight strands precisely wrapped. There were five knots at various positions, 613 in total, which are the exact number of commandments and statutes in the TORAH. The cords colors were white and blue-dyed fabric. The LORD GOD’S instructions to the Israelite men were to LOOK at the fringe (Hebrew=Tsitzith); to remember to perform, obey, do, carry out His commandments. “They [scribes andPharisees] do all their works to be seen of men; for they make wide their phylacteries (small cases enclosing certain Scripture passages, worn during prayer on the left arm and forehead) and make long their fringes [worn by all male Israelites, according to the command] [Exod. 13:9; Num. 15:38; Deut. 6:8]” (Matthew 23:5). “Woe to you, scribes and Pharisees, pretenders (hypocrites)! For you are like tombs that have been whitewashed which look beautiful on the outside but inside are full of dead men’s bones and everything impure. Just so, you also outwardly seem to people to be just and upright but inside you are full of pretense and lawlessness and iniquity” (Matthew 23:27, 28). “And on the Sabbath day we went outside the [city’s] gate to the bank of the river where we supposed there was an [accustomed] place of prayer, and we sat down and addressed the women who had assembled there. One of those who listened to us was a woman named Lydia” (Acts 16:13, 14–Amplified Bible). 1. She was a dealer or seller of fabrics dyed in purple. 2. She was already a worshiper of God. 3. Prayer was part of her life, even in her business. 4. She opened her heart to the Scriptures. 5. She was baptized along with her household. 6. She was confident in her belief that Jesus is the Messiah and the Author of salvation. 8. She was hospitable, even to strangers. What do these characteristics and description of a woman by the name of Lydia have to do with “tent-making”? One of the mysteries scholars have debated over the centuries is about the exact shade of blue represented by the “tekhelet“. The Bible mentions the color in the ceremonial robes donned by high priests. Also the ritual prayer tassels worn by the common Israelite. What IS known about Tekhelit (pronounced t-CHELL-it) comes from the Talmud; the blue dye is produced from Murex trunculus secretions, the sea-snail still found in Israeli beaches. Traditional interpretations characterized Tekhelet as a pure blue; symbolic of the heavens so that Jews would remember God. Other Israeli scholars say the original color was closer to a “bluish purple“. Today, the blue in the Israeli flag was inspired by the Tekhelet. What does the Tekhelet and the color blue have to do with making tents? Well, I see a real possibility of an opportunity presented to Paul; his meeting the woman at the river, a seller of fabrics dyed in purple in the city of Philippi, a lady named Lydia. What if…just thinking, she also sold blue fabric or perhaps even blue dyes? Do you see where I am going? Does it really make a difference in the grand scheme of things? Since Corinth was a Roman colony, could Paul, Aquila and Priscilla TENTS of leather be of use to the Roman soldiers as they bivouac? Or, could there craft and expertise have been in the making of TALITH’s; “little tents” with the color blue embedded in the cloth? Maybe. My purpose was to bring you only to the possibilities; the “This” or “That” of Paul the “Tentmaker”. Allowing the Holy Spirit to teach and guide us regarding the “prayer shawl“; the “little tent” in bringing you a little closer to Jesus; to understand Him better as Messiah. Whatever the “tent making” was, the apostle Paul supplemented his ministry by the income he earned. I know of a pastor friend who sells eggs by the dozen to supplement his income and further his outreach as an apostle. I believe there is NO evidence that Lydia was a christian before meeting Paul at this market! The scriptures rather indicate that after Paul spoke, that she received and believed, then was Baptised etc with her household! So tired of people making the mistake and making out that she was already a christian. It doesn’t say that!!! There is no evidence, as you pointed out. That said, Acts 16:14 does say she was [already] a worshiper of God, and the Lord opened her heart. Perhaps she was a non-believer or perhaps she was unconvinced that the Jesus Paul was talking about, was the Messiah and the Author of salvation. Perhaps it was immaturity in the Lord rather than being a pagan. But you are correct in stating, there is no [direct] evidence. I HOPE there’s evidence in your life that you are a believer. “If you were arrested for being a Christian, would there be enough evidence to convict you?” I hope so! This was an excellent article. That did not appear to be biased. As I read some of the comments I’m amazed. If you want to think like a Greek I guess you’ll never change. Here is where I believe that the spiritual significance of the tent in all various forms are helpful in understanding the actual evangelism efforts that Paul was dispersed by God to do and that his actual trade was to sustain him until more help arrive to complete his mission. See symbol meaning of “tent”. How do we reconcile the switching of the two words? Do you have evidence that Acts was written in Hebrew and then mistranslated into greek later?
. . . just for the mix, as to Greek & Hebrew, one of the contemporary struggles we have to wrestle with is that Adoni Elohim is the God of gods – yet Greek only has Theo’s (God) for any god, so that the real meaning, translation and even reference, in Greek, becomes somewhat lost,it seems. This, I think, gives further support to the “little tent” proposal; I wonder if the word ‘little’ would be dropped in light of there being a range of tallits, from quite small, to (comparison) honkin’ huge! As said, just for the mix. . .